Boil and potatoes and mash it. Add salt, sugar, lemon juice, garam masala, green chillies-ginger paste, coriander leaves and mix it well. Make 12 equal rolls. Cut the corners of bread slices. Take a bowl of water and add 1 teaspoon of salt. Take a slice of bread. Dip it in the water slightly and take it out immediately. Press it with your hands to drain out all the water. Put one potato roll on the slice and roll the bread properly on all the sides. Make rolls like these of all the slices. Take a frying pan and heat the oil. Deep fry all the rolls. 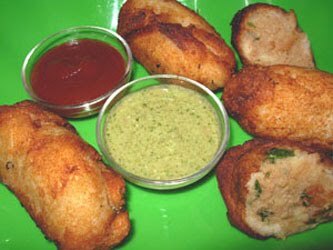 Serve it hot with tomato ketchup and green chutney.